FOXBOROUGH, Mass. (AP) — From growing up in Brooklyn to his playing days at Syracuse, from not getting selected in the 2006 draft to starting at safety in San Diego, Steve Gregory has never taken anything for granted. The NFL, after all, can be a tough place. He’s happy to still be in it. “It’s been heck of a journey,” the six-year veteran said. “I can remember coming from college and just stepping into camp as that guy that’s sixth string on the depth chart, and just hoping you could stick around. That’s good news for the New England Patriots, because they clearly need a kick-start in the secondary. Something, anything to improve a defense that ranked 31st last year in total yards allowed. After starting 13 games last season for San Diego, Gregory signed with New England during the offseason as part of the organization’s effort to stabilize that defense. When Gregory received a call from Patriots coach Bill Belichick, the decision was simple. Gregory, 29, has started alongside safety Patrick Chung since the beginning of training camp, developing a rapport along the way, and has impressed coaches ever since his arrival. 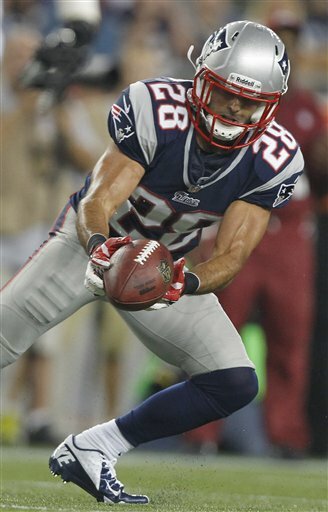 “He’s a versatile player,” Patriots director of player personnel Nick Caserio said. “He was able to do a number of different things in San Diego’s defense. I think some of the things that we’re doing are a little bit different, just systematically. But he’s indoctrinated himself into our system well. The relationship with Chung, Gregory said, is of the utmost importance as the Sept. 9 season opener draws closer. While Gregory’s professional experience doubles that of Chung, the two actually complement one another because Chung has spent the duration of his young career playing in New England’s defense. On Tuesday, Gregory intercepted quarterback Tom Brady during the afternoon session, and the latter vented his frustration afterward. Practicing against one of the most potent offenses in the league has certainly been a welcome challenge, too. That’s been Gregory’s thought process since he first started. He’s maintained his focus, all along. Especially as he watched the draft come and go, never hearing his name called after a memorable career with the Orange. But the Chargers didn’t care. They gave him a chance as an undrafted free agent, and he worked his way up through special teams. Yet no matter how much he plays, he’ll always carry that chip on his shoulder. The one that reminds him where he really came from. His diploma may read “Syracuse,” but his mindset says otherwise.